We are happy to announce the 6.3 Final release of OptaPlanner. OptaPlanner is a lightweight, embeddable planning engine written in Java™ to solve constraint satisfaction problems efficiently. It is released alongside the Drools rule engine and the jBPM workflow engine. Defining the optimization algorithms and their parameters is now optional (but still possible and desirable for power users). If you don’t define any solver phases, a default Construction Heuristic followed by a default Local Search is used. It’s even possible to limit the scan to specific packages. This applies to the programmatic API too, of course. 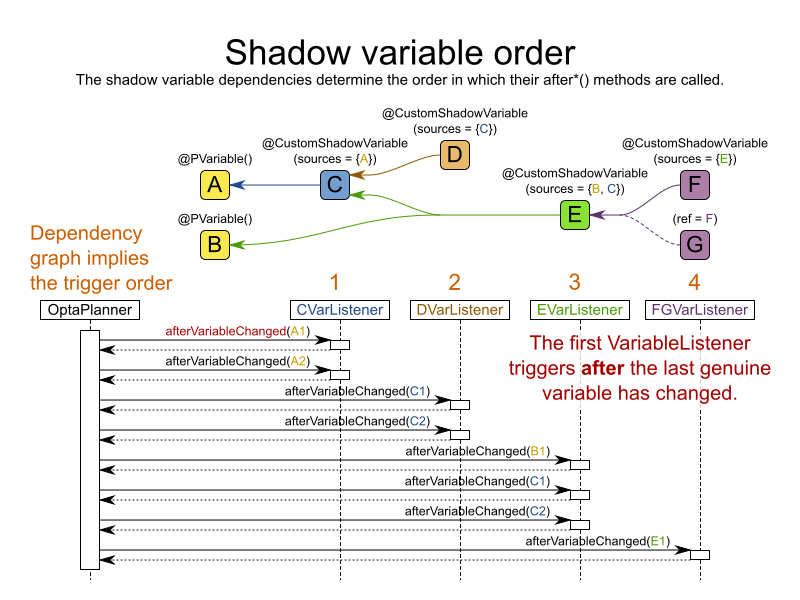 In advanced use cases with multiple custom shadow variables (or even just one), the immediate order in which a VariableListener was triggered could drive a developer insane because (s)he had to deal with intermediate, inconsistent states for which not all of the genuine variables were already changed. This has been fixed. OptaPlanner now triggers the VariableListener.after*() methods in the order defined by the shadow variable dependency graph. It guarantees that the first VariableListener triggers after the last genuine variable has changed. It also guarantees that the second VariableListener triggers after all the first VariableListener calls are done, and so on. To optimize an investment portfolio. See this video. Partially contributed by Satish Irrinki. A bi-directional relationship with a planning variable is now also supported for a non-chained variable. 2 shadow variables can now share the same VariableListener instance. ValueRangeProvider now supports long ranges with createLongValueRange(from, to) too. ValueRangeProvider now supports BigInteger ranges with createBigIntegerValueRange(from, to) too. Improved Move.toString() methods for more clearer log messages. Benchmarker report mentions logging level used. Contributed by Matej Čimbora. Documentation for Android. Contributed by Tomáš David. Benchmarker’s <solverBenchmark> name now allows non-ASCII characters too (for example Japanese characters). Drools score calculation now support multiple constraint matches in the consequences part of a rule. More JavaDocs, including package JavaDocs. Various bugs resolved. See our issue tracker.